The Ham field was originally a marshy area which was a flood plain for the Sid. It was probably a sea marsh at times when the shingle was low. It seems the Ham was not a popular place for locals or visitors until pressure on building space drove people to confine the Sid and build up the land level. It would seem incontrovertible that the Sid at some time ran mainly to the east of the Ham as the land was at first part of the parish of Salcombe Regis rather than Sidmouth, as is documented in the tithe map of 1840. 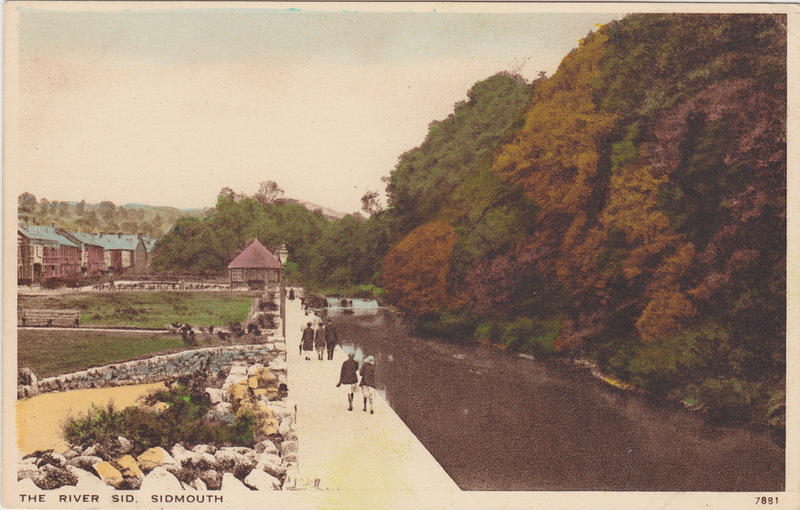 The first wooden Alma bridge was built in early 1856 to make it easier to travel from Sidmouth to Salcombe Regis but it wasn’t until 1900 that the current bridge was erected, a Sampson design in the Japanese style. At the time the Gas Works was built by Mr Dunning in Eastern Town ( 1875 ) the Ham field was part of the same property. It was sold to Mr Colin Sleep when the Gas Works was sold in 1886 and in the same year he had to instruct solicitors to prevent the Local Board (the equivalent of the town council today ) appropriating blocks of stone and concrete from it for use in the breakwater at the western end of the town. 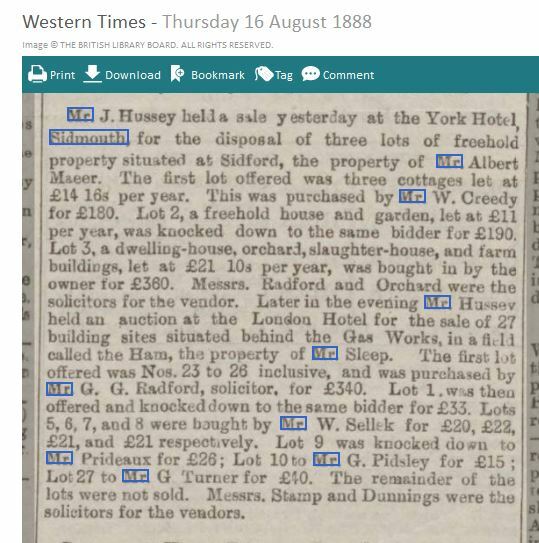 By 1888 the largest portion of the Ham was owned by Mr Radford, the rest having been sold as building plots. 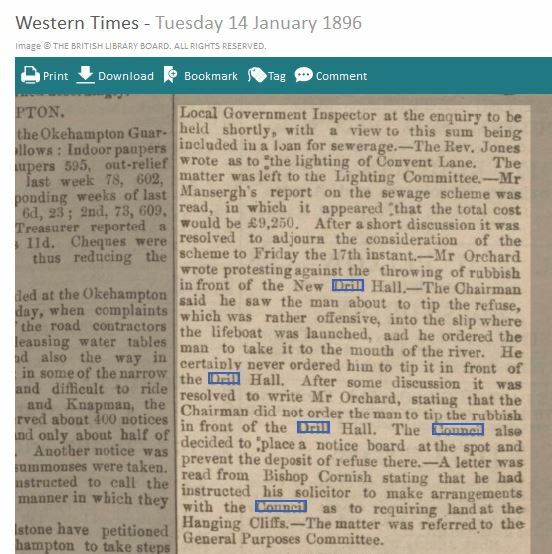 In 1889 candidates standing to represent the Rate-Payers Association on the Local Board stated that they were in opposition to the purchase of the Ham Field for a pleasure ground: but in 1893 there was a committee which was taking steps to create a scheme for laying it out when they ‘were in a position to ask for powers to purchase’. 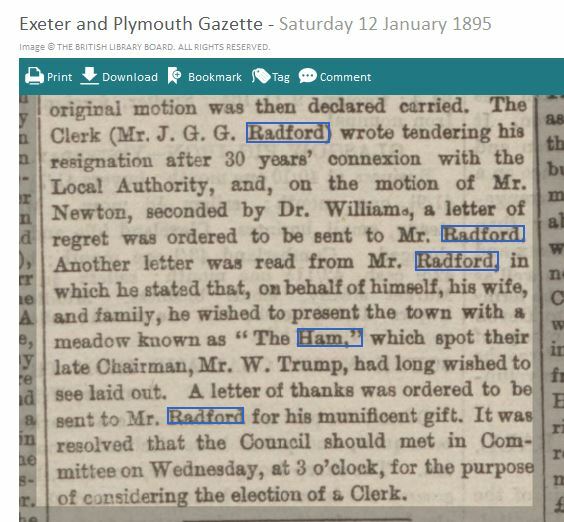 In Jan 1895 it was reported in the Exeter and Plymouth Gazette that Mr Radford was giving the land to the town and that there were no restrictions on the gift, but of course they were misinformed as there was a covenant put in place that it had to remain an open area for pleasure and recreation. The conveyance of the land was a protracted one as the document is eventually dated March 1896. 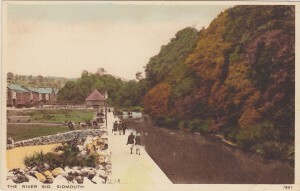 Summer 1896 saw the beginning of the controversial new sewage scheme for Sidmouth. 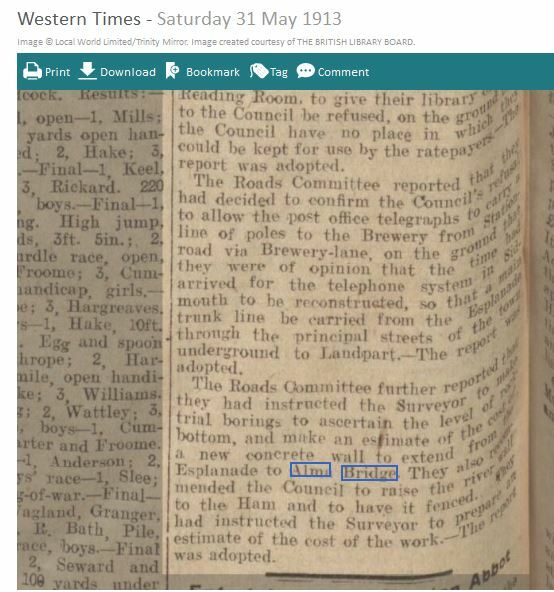 As well as replacing and updating sewer pipes it involved building a sewage tank, which was completed in Dec 1897. 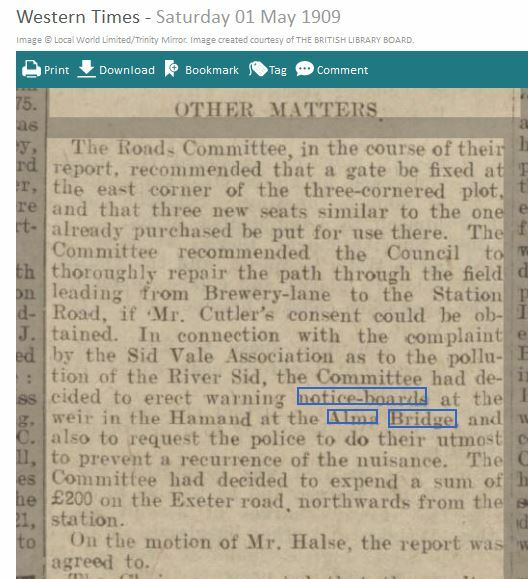 It was built under the Ham just north of Alma bridge and caused great distress to Mr Radford because of the damage to the area. The tank was only covered by 18 inches of soil which meant that even grass found it difficult to grow there. The area was not attractive and the intentions behind the gift and original Council scheme were not achieved. 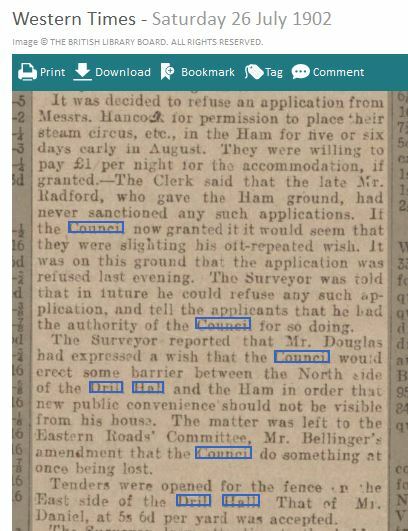 Locals continued to dump rubbish there as reported in 1896, 1903, 1909, 1910, through to 1913 when the Ham was extended as detailed below. Fairs and Circuses occasionally used the Ham but these were progressively discouraged by the Council as the Ham became more formally laid out in the early 1900s. This picture is from between 1903 and 1905, it is a detail from a real photograph sent as a postcard. I believe it shows the early urinals which were placed behind the Drill Hall. It does show the plantings meant to eventually hide the Gas Works and also the fence which was built on the Ham land, to separate that land from the Drill Hall land. There seems also to have been a fence placed from the rear of the Drill Hall to meet the end of Alma Bridge, although that was not the full extent of the Ham which stretched to the shore. The fence alongside the Drill Hall was built in 1902. When a children’s playground was first created it was not universally popular. In the playground, which filled the southernmost part of the Ham, there was a yachting pool as well as swings and roundabouts and it seems to have been very popular with both local and visiting children. However, there were loud complaints from the owners of lodging houses, about their visitors being disturbed by the noise from children. The visitors who frequented this part of town often did so because of the quiet to be found there ( and because it was cheaper!). 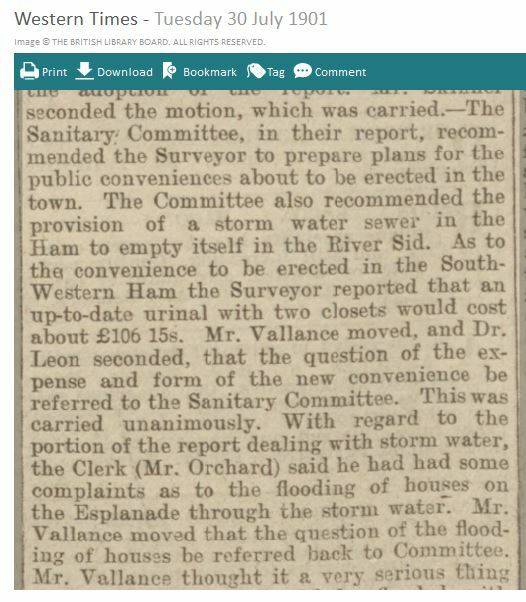 In 1909 a scheme to layout the Ham and provide ladies toilets was put forward, but I don’t know if it was ever carried out. 1913 saw another Ham layout scheme being proposed along with a further extension of the Esplanade. This design would involve bowling greens and a pavilion as well as the children’s playground. Of course this, like so many others, fell by the wayside as the scheme took little account of the terms under which the land had been given to the town and was too expensive. The Esplanade was extended to reach Alma Bridge in this year. When the sea wall crumbled in the winter of 1924/5 a large part of the Esplanade had to be rebuilt. While this undertaking was underway the Council also made changes at the Ham end of the Esplanade. The Ham itself was used as a block yard for making the concrete blocks to be used in the sea defenses. Shingle was taken from the shore to be used in the concrete, a corrugated metal shed was erected next to the Drill Hall for the use of the workmen and the whole area looked a mess. At the conclusion of the work another scheme was required but nothing was done for some years. 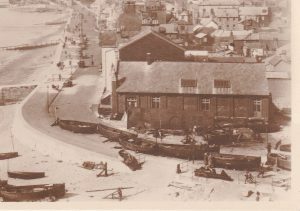 During this period the metal shed which had been erected for the workmen was bought by the Council and retained for use by the fishermen. The eastern end of the Esplanade was again an eyesore. The Ham and Hangar Pleasure Grounds scheme took place in 1929. This scheme included replacing the urinals at the rear of the Drill Hall grounds with a combined toilet and shelter block on the east of the hall. A large turning circle was laid out to cope with the problems of people taking motor vehicles along believing there was a way through. The river walk, the wall beside it, the flowers and shrubs were all upgraded and at the finish it looked almost as it does today. The riverside walk was an important part of this scheme as the river was at that time very attractive, it was lit at night to make it a pleasant evening promenade. 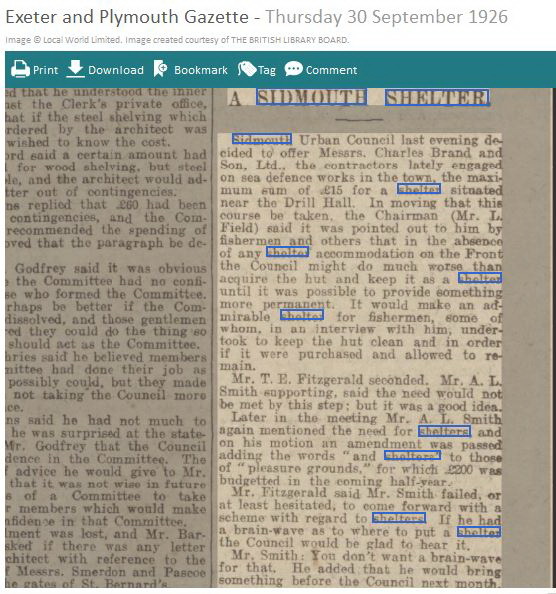 The land was registered with the Charity Commissioners when Mr Radford gave it to Sidmouth Urban District Council, and registered as a modern charity in Sept 1962 under the control of Sidmouth Town Council with the title ‘Ham Playing Field’, its number is 300967.